No modelling done today, still recovering from the show yesterday but I have managed to free up some space in the display cabinets and had a general tidy in the man cave. However I've now got another three boxes of older built models to go in the loft! I'm seriously thinking about selling a few of my older builds as it seems a shame to have them up in the loft and not on display. I'd love to have them all out but that would mean most of the cave being turned over to display space. It's got me thinking about what people do with their completed builds and what if any market there is out there for them? 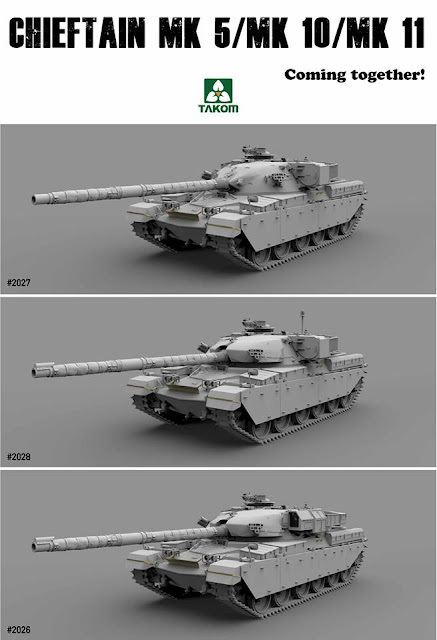 I've also been reviewing the latest news and am delighted that Takom will be releasing a Chieftain Mk5, Mk10 and Mk11 all at the same time. Brilliant news that, I'll certainly be adding a Mk5 & Mk11 to the stash. I've already however seen the same old remarks come up on various forums about the accuracy of the kits etc. All before anyone has actually seen the model. Is it just me or is everyone else getting really fed up about all this negativity in the hobby at the moment? We've never had it so good with the amount of new and hitherto unheard of plastic kits but it seems some people are always ready to put a kit or manufacturer down. What's wrong with these people? maybe it's because the Internet empowers certain types who otherwise would not wield any influence whatsoever in the real world. I read the comments and sadly shake my head, however some people are actually influenced by these threads. A case in point was yesterday when I was talking to a chap about my Saladin & he mentioned that he had read it was rubbish and had not bothered to get one even though he was keen on the vehicle. Obviously I showed him that actually the kit's pretty good and with a few simple additions and improvements a really nice kit can be made. He was pretty chuffed that I took the time to explain what was needed to him and that it's all here on the blog for all to benefit. I think a lot of people have either forgotten or don't know how to use basic tools and materials to improve a model these days, they seem to want every last detail made in the form of etched sets or resin improvements and bleat endlessly if these are not available immediately instead of having a go themselves, I thought that was what modelling was all about? (well it was when I started) The Internet has certainly made modellers lives easier in many respects but sometimes I think the few have far too much influence over the rest. My solution? well it's always been build what you want improve and replace what I think is necessary, for both the final look and my own sanity! and don't bother about the petty things. You can chuck everything under the sun at a kit but once it's got paint on unless you know your subject you're not really going to know what if anything has been added. And most importantly have fun! That's what any hobby should be about first and foremost surely? OK rant over I feel much better now, ha ha! Stonehenge Modellers second show of the year this and a local one too being 5 minutes from Brian's gaf. So after an RV at Brian's & loading up of the car it was time for a leisurely bacon buttie & coffee before driving the short distance to Laverstock and the shows venue. Our usual efficiency meant that we were set up in about 10 minutes and enjoying another well earned coffee before the public were admitted at 0930hrs. As usual there was a good mix of traders and for a change the opportunity to get all those consumables which we all need to stock up on from time to time. It seems a lot of shows at the moment have plenty of kit sales but very little in the way of glues, paints and other bits so today was a refreshing change with a choice of at least three traders selling those items. There was plenty to look at on the club tables although I only had a limited amount of time to take a few pictures. I know there will be plenty more pictures if you are interested over on the Modelworxs forum in the next few days. Speaking of those reprobates they again gained plenty of awards in the competition, well done lads. As usual it was great to see you and have a right good laugh! So another excellent day of modelling nonsense and general banter, thanks to IPMS Salisbury & Richard for the invite & see you next year! My kit sales went very well as well and I came away with more money than I started with (that's all for the Belgian fund) But also managed to come away with a couple of kits and those all important consumables! AMX-30 Turret Done, Kit Built! The turret's all finished now and the kit's all ready for a wash then primer. I made a few improvements to the turret in the form of replacing the tie downs with some thin lead wire and adding a few bolts here and there as well as a couple of handles on the rear bin. A thin coat of Mr surfacer was added as well to give the turret a slight bit of texture and to tie everything together. I also used the Orange hobby metal barrel as I'm lazy and hate sanding down seam lines on barrels! Talking of seam lines the side stowage cages had some serious seams which needed to be removed, nothing a fresh scalpel blade and a bit of patience can't sort out. I'll add some straps and camo netting to these once the main paintings done. 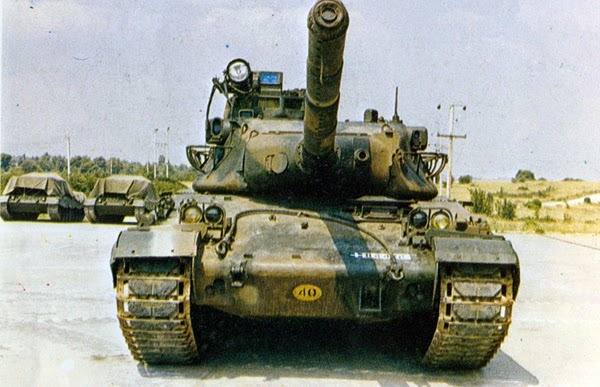 I'm very taken by this model & I like the lines of the tank, it looks very compact yet deadly! As it's the IPMS Salisbury annual show tomorrow I'm in the middle of packing my models & sorting out some surplus kits for sale at the show. So if you are there drop in on the Stonehenge Modellers stand and say hi. The hull of the model is now finished and here the only additions were replacing the plastic tow cables with some brass wire, a couple of padlocks on the front hull stowage bins and some cabling for the front lights and infantry phone on the rear. Also you can see the resin parts from the Slingshot conversion set. Meng AMX 30-B Greek Style! I've actually been working on this model since the end of April but for some reason have forgotten to post it up here! Probably as the other two projects have been taking up most of my time and thinking power. 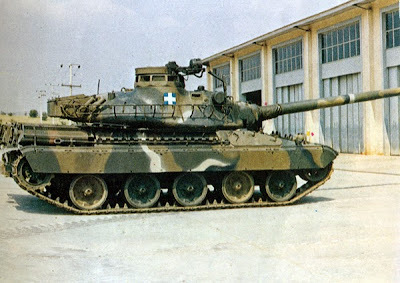 Anyway I'm going to attempt to model an AMX 30 in Greek service if for nothing else than the very interesting colour scheme and to have something a bit different on the display tables at shows. I'm also using Slingshot models very nice conversion set with the Meng kit. This gives you all you need for a Greek/Cypriot & Qatari versions. As you would expect the kit builds up beautifully and exhibits excellent detail. 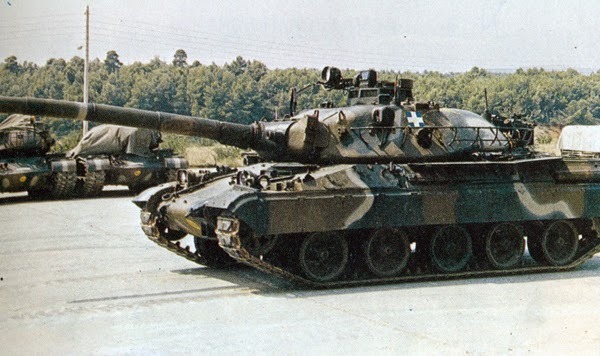 The tank itself has loads of bits hanging off it, very few stowage boxes here, which makes for a very different look to say Chieftains & M60's. In fact it's quite a small tank compared to the other two. My main concern with the kit was the tracks, although excellent they are quite fiddly to construct and try as I might I could not get them to articulate. They just kept breaking up. My solution was a set of Friulmodel tracks set No ATL-115. Not entirely needed BUT I'm much happier building them than plastic tracks and can build them in a fraction of the time it takes me to build the plastic ones. As for extra expense I actually ordered them direct from Hungary which saved a fair bit of cash. They also look excellent on the model and add a nice bit of weight to the model giving it a better looking sit. To help me with the Camo and more importantly the markings a set of decals from LM Models has also been obtained, I'll be doing a small review of them soon. Lastly here's a few pictures of that rather smashing Greek camouflage scheme. Onto the Somua again and I've started all the detail painting on this. The tools received a coat of dark yellow for the wooden portions then a coat of oil paint. After about 15 minutes I then used a brush to remove the excess. Whilst I had the oils out I gave the figures jacket a coat of black then removed the excess as above. The rest of the detail painting then took no time at all and I'm particularly pleased with the tarp on the rear hull. The details have really popped on this. Straps on the tarp and bins were picked out with vallejo leather belt. Some chipping will be added next but this will be the bare minimum around hatches and the tow points. The model and base are all now complete. Nothing too fancy for the base just some static grass and clumps and a tree for the background. The combination of the truck and figures really makes for an appealing scene and tells a nice story. It's been a really fun build and I've enjoyed every minute of it including painting those tiny figures! So that's number 5 for this year so far, maybe I'll get to double figures? Airfix Bedford Truck & All Hail Takom!